Two games into the Stanley Cup playoffs and the wheels are beginning to fall off in Vancouver. It may not be time to panic quite yet for Canucks fans, but the end feels pretty close despite heading into the post-season with such optimism. Sure the Canucks have only lost two games, but they're heading into Los Angeles down two games to none against a team that has completely owned them on special teams - the Canucks' supposed bread and butter. The game was a confusing one for Canucks' fans, as they team recorded 48 shots on Jonathan Quick, including a 23-9 advantage in the third period, despite being short-handed four times in that frame. Roberto Luongo: A- : Lou was solid in net again. Kept the team in the game and made several key saves. Cannot be blamed for any of the goals tonight. Keith Ballard: B : Not bad for his first game back. Alex Edler: C : Edler's brain cramp cost the Canucks once again as they gave up the opening goal despite controlling most of the play in the first period. Two games, two costly giveaways, and many others that were not converted. Dan Hamhuis: B- : Caught out of position a few times, Hammer wasn't as good as Game 1. Sami Salo: B : Tough to fault Salo tonight for much, but the power play was atrocious and he's a large part of it. Chris Tanev: B- : Tanev rebounded from an iffy outing in Game one. David Booth: A : Arguably one of the best Canucks' forwards. Booth hit everything in sight and created some offense. Alex Burrows: B : Burr wasn't particularly noticeable on offence tonight, except when he was trying to pry Quick's mask from his face. Should stick to playing hockey. Andrew Ebbett: B- : Didn't add much value to the power play, but maybe he can't be blamed for that. Barely noticeable. Jannik Hansen: A : Perhaps the Canucks' MVP through two games. Hansen brought consistent effort and scored the first Canucks' goal. Pestered Drew Doughty and had four shots in only 12 minutes of ice time. Chris Higgins: B : Higgins had 6 shots tonight and was good on the forecheck as usual. Zack Kassian: C : Kassian had one good chance in the first period, but with only six minutes of ice time, I'm wondering why we traded Hodgson for this guy. Surely Dale Weise could play six minutes. Ryan Kesler: A- : Kesler shut up and played hockey tonight after being challenged publicly (vicariously perhaps) by Alain Vigneault. Kesler had six shots and numerous dangerous rushes. His line was the best tonight for Vancouver. Max Lapierre: D : D for Diving. Rather than be a feisty distraction to the opposition, Lapierre was ineffective tonight and was lucky to not be called for diving for his horrible act on Drew Doughty midway through the game. Manny Malhotra: C : Manny's giveaway led to the back-breaking goal that put the game out of reach. Solid defensively for the most part, but he looked a bit lost out there tonight. Samuel Pahlsson: B : Pahlsson scored a goal and was 5-1 on faceoffs. 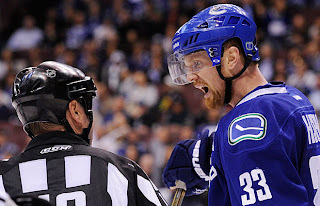 Mason Raymond: A- : The favourite Canucks' whipping boy played a pretty good game tonight. In typical Raymond fashion, he creates chances out of nothing, but subsequently fanned on his shot, fell down or missed the net. But, he recorded 7 shots, was dangerous all over the ice in only 14 minutes of ice time. Henrik Sedin: B : Hank's numbers and effort looked good tonight. Six shots and an assist for the Captain look good, but he deserves some blame for the lacklustre (abysmal) power play. Overall, the Canucks need a leader to step up and other than Roberto Luongo's inspired play, there aren't a lot of contenders. These two games have been plagued by horrible turnovers in the defensive zone and an atrocious power play. The Canucks had two chances in the third period in Game One to take a 3-2 lead on the power play but failed, and wound up losing. Tonight, the Canucks could have taken the lead with their first period power plays, but dropped the ball again. Their power play is now -2/9, while the Kings are now 3/12. -22% vs. 25%. Yikes.